Compared to the three-model roster in the previous year, Hyundai significantly expanded the lineup of the 2019 Santa Fe. Affordable and reliable, this crossover SUV is now available in seven editions. Instead of having three rows for up to seven individuals, the updated Santa Fe comes standard with two rows for five people. 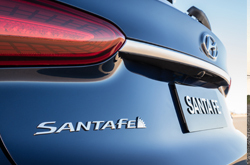 If you want the third row, you will have to check out the new Santa Fe XL coming soon. You'll also enjoy some all-new safety features in the 2019 model, such as the Collision-Avoidance Assist and Driver Attention Warning. A compact turbocharged engine and the HTRAC AWD are some notable new features under the hood of this premium crossover SUV. Which Trims and Tech is Available for 2019? The lineup for the 2019 Santa Fe kicks off with the SE base trim. Having more advanced features than the entry-level edition, the SEL and SEL Plus models. Then there is the Limited and Limited 2.0T. If you're looking for the best possible amenities in the Santa Fe, get the Ultimate or Ultimate 2.0T. You don't have to spend a fortune to enjoy advanced digital technology in this Hyundai crossover SUV. Optimized for hassle-free smartphone connections, Apple CarPlay and Android Auto are standard in every model. The Blue Link Telematics, Connected Care and Remote are set up in the SEL and above trims. 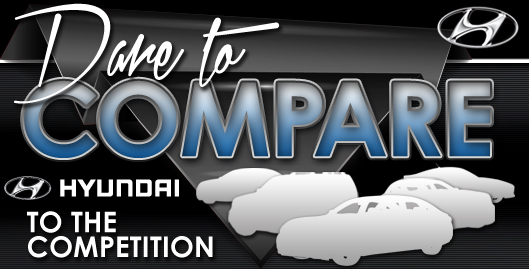 If you want the Guidance Package, you'll have to drive the Ultimate or Ultimate 2.0T. Both of these models have an 8.0-inch GPS navigation system with maps in color. A head-up display, wireless charging system and the Surround View are some other high-tech installations that are exclusively installed in the Ultimate and Ultimate 2.0T. 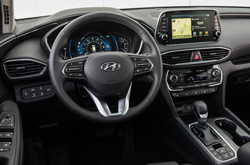 The Santa Fe also offers the Infinity audio system, which has 12 speakers with acoustic-enhancing technology, such as Quantum Logic Surround and Clari-Fi. A 2.4 L gasoline engine propels five of the 2019 Santa Fe models. This naturally aspirated I-4 powertrain delivers up to 185 horsepower at 6,000 RPM. When the dial on the tachometer hits 4,000 RPM, the four-cylinder engine produces just less than 180 pound-feet of torque. The Limited 2.0T and Ultimate 2.0T are driven by a 2.0 L turbocharged engine that whips out 235 hp at 6,000 RPM. You'll get 260 lb-ft of peak torque when this compact engine revolves at 1,450 RPM. Every 2019 Santa Fe is equipped with a standard front-wheel drive, which could be substituted with the the HTRAC all-wheel drive. For 2019, Hyundai decided to keep the conventional SHIFTRONIC in the automatic transmission system that has eight gear ratios. With the exception of the base trim, the Drive Mode Select is standard. Each edition has the Idle Stop&Go function, which reduces fuel consumption when the car stands still. How Safe is the 2019 Hyundai Santa Fe? Hyundai has made some major updates to the active safety systems that are available in the 2019 Santa Fe. The all-new Collision-Avoidance Assist technology is paired with the Blind Spot and Rear Cross-Traffic systems. Also making its debut, the Parking Distance Warning Reverse gives you more confidence for backing up. Scanning the road ahead for potential trouble, the Forward Collision-Avoidance Assist has the Pedestrian Detection. This Hyundai crossover SUV also comes standard with the Driver Attention Warning, which senses abnormal driving behavior. Additionally, the Lane Keeping Assist and Safe Exit Assist reinforce the Santa Fe as one of the safest models in its class. There are also plenty of other active safety installations in this Hyundai, like the Downhill Brake Control and Vehicle Stability Management. 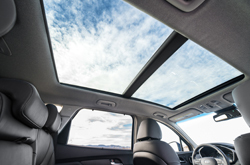 Visit Camelback Hyundai today in order to experience the all new 2019 Hyundai Santa Fe.